For the past 50 years, computers have been add-ons to our lives, evolving from complex, room-sized machines to simplified, but powerful, pocket-sized assistants embedded in every facet of our lives. Like most solutions, AR’s entrance into the workplace was conceived out of a challenge a company faced. In 1990, factory workers at Boeing had to rely on painstakingly complex airplane wiring instructions that were displayed on large plywood boards. At each step of the manufacturing process, workers had to manually rewire each board – no easy task given the deadlines, complexities, and inefficiencies. Two Boeing researchers, Tom Caudell and David Mizell, introduced AR and AR headsets to the factory floor (and subsequently coined the term “augmented reality”). Factory floors arguably became the first places where AR was used daily to enhance worker productivity and streamline supply chains. Fast forward to today, companies like General Electric (GE) have increasingly incorporated AR (through both mobile devices and headsets) as part of their factories’ workflows and processes. And it’s no surprise given that numerous studies have shown that the use of 3D instructions, i.e., the kind displayed through AR, can amplify people's efficiency and ability to focus on tasks. While factory workers, technicians, and maintenance workers have used AR for decades, you’ll rarely find AR being used by office workers. After all, why would office workers need to wear headsets that display holographic information? 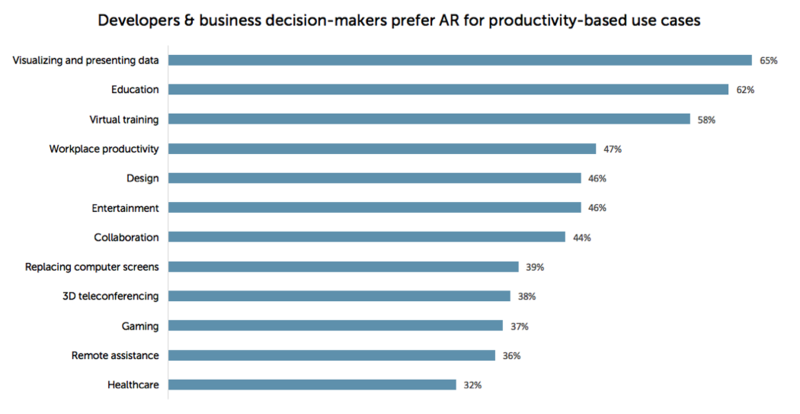 And coupled with the fact that the computers and corresponding software applications office workers have been using seem rather intuitive, it doesn’t really make sense to use AR in the office – or does it? Architects and designers have been turning to AR to overcome some of the productivity limitations inherent to working with 3D models and designs in 2D (our brains have evolved to become finely attuned to navigating the 3D world around us). And while powerful CAD and modeling software like SolidWorks and Revit (along with more traditional tools like pencils and paper) continue to help architects and designers, AR architectural applications like Schema – which enable users to quickly concept, prototype, and build 3D structures in the first stage of the architectural design process – are further streamlining architects’ existing workflows. What does data visualisation look like in AR? It’s one thing to analyse rows of data across several Excel sheets. It’s another thing creating charts and graphs that clearly communicate what the data means. And while it’s considered best practice to refrain from displaying 3D bar charts or lines on a 2D surface such as papers and screens, those 3D bar charts and lines become useful and add an extra layer of informational cues that help people better understand the data they’re interpreting. That’s a consideration that Great Wave, a professional services firm with extensive experience in developing business and productivity apps, has taken into account as part of their work on data visualization for AR . They recently built an application, Analytics AR, that takes organizations’ Salesforce sales data and visualises the data in AR so that users can do what they’ve always wanted to do: touch and directly manipulate the data they’re analysing. 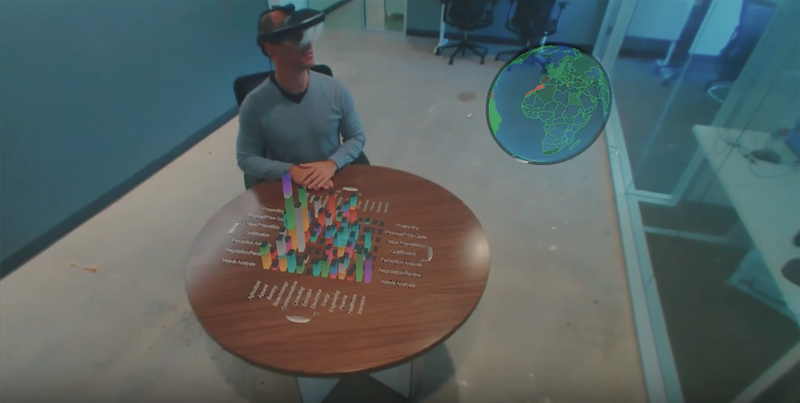 Not only does Analytics AR make data analysis and visualization more compelling, but it allows people to literally dive and dig into their data. With the Fourth Industrial Revolution well under way, now is the time to futureproof your workforce and plan out how you can leverage AR to enhance worker productivity and optimize existing workflows and processes. With tech luminaries like Apple and Google developing AR headsets and platforms, AR is undoubtedly shaping to be the next computing platform – so why wait to incorporate it into your workforce?